It was great to see the sunshine and warm weather again last week Friday. Since Jenna is an early riser we had everything inside done by 9:00 am and headed for a walk to downtown Zeeland. We stopped at the bank, post office and of course the bakery for a donut. I'm going to miss this part of living right in town. When we got back home we got out the sidewalk chalk and drew some pictures. 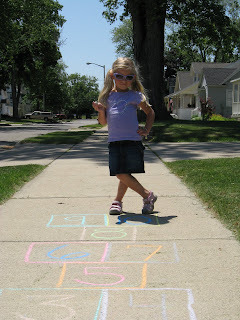 One of Jenna's favorites is playing hopscotch. She loves to pick out various colors for the squares and numbers. Here's our little "diva" after jumping to the end. 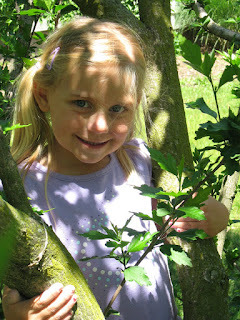 Then it was on to something different and she decided to try climbing the tree (the overgrown bush in our front yard). It's low to the ground so it's not dangerous or anything. It's so cute to watch her sheer determination to get up in there by herself. 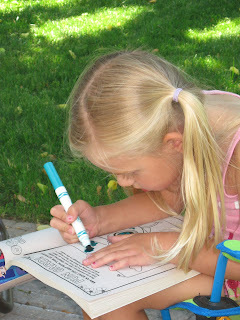 Next was on to our picnic lunch outside and then coloring. She loves to sit and color. And yea, notice the outfit change....why do girls insist on changing their clothes so much! 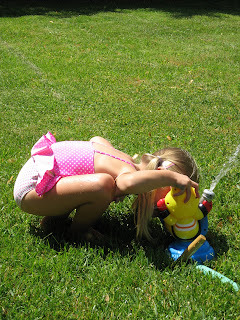 By mid afternoon it had warmed nicely and Jenna was hot so we got out the Elmo sprinkler and cooled off. Jenna's favorite thing to do was drink the water from it. 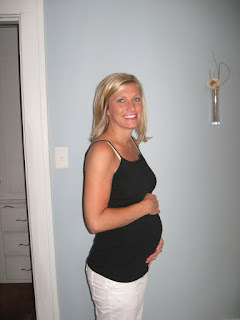 Hard to believe we've already over the 28 week mark of the pregnancy! It is going so fast. I'm feeling really good and growing every day. Hard to believe in 12 weeks (probably more like 13 with my luck) we'll get to meet this little guy or girl! The house is coming along. We have about 5 more weeks before we need to be out of our current house. We're hoping the new one will be complete mid-September. When there are more exciting pictures I'll post some.